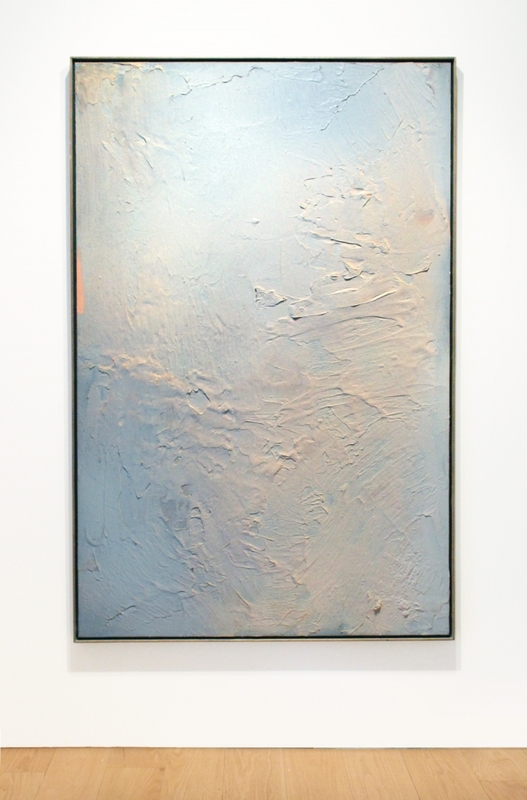 The paintings at Leslie Feely are no longer as bright and warm as Olitski’s best-known “stain” paintings of the early ’60s. They have even moved on past the still-radiant palette of the sprays, to a nearly monochromatic Olympian detachment. These paintings aren’t minimal, though. Unlike the rigidly geometric works of Robert Mangold, Jo Baer or other minimalists of the period, Olitski’s freer surfaces glow with evidence of the human hand at work. Paint has been irregularly scraped, spread, sprayed, swept or swiped onto the canvas, whether it’s quiet gray, tan, gold or another color. “Beauty Mouth 16” (1972) is predominantly dusty rose. “Salacion Touch-3” (1978) is a lively pale liverish hue, with one little vertical wiggly line down the center. “Nimrod Measure 10” (1978) is sunlit yellow, with hints of a darker spray. And they're all just -- plain beautiful. Olitski, who died in 2007 at 84, benefited initially but may have suffered since from the fact that throughout the 1970s and ‘80s, controversial Clement Greenberg called him “our best painter.” Maybe now viewers can appreciate his work upon its own merits.